They say beauty can be deceiving and we’ve never been so right about Yuuki Asuna. Our main heroine from the popular anime series, Sword Art Online. An absolute match for the series’ main protagonist, Kirito, Asuna isn’t only gorgeous but also valorous whenever facing the ferocious monsters of Aincrad. As vice leader of the Knights of the Blood Oath, she had lead the guild into many successful raids earning them a chance of survival in the virtual world of Sword Art Online. Though a strong-willed woman isn’t always unyielding. They can be cute at times and Yuuki Asuna is also like most women from any anime. 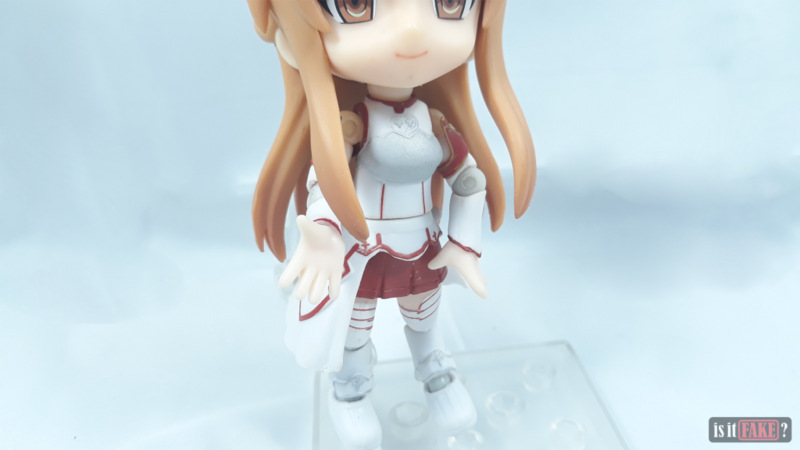 With that in mind, Kotobukiya decided to create an embodiment of cuteness for our charming heroine, Asuna. 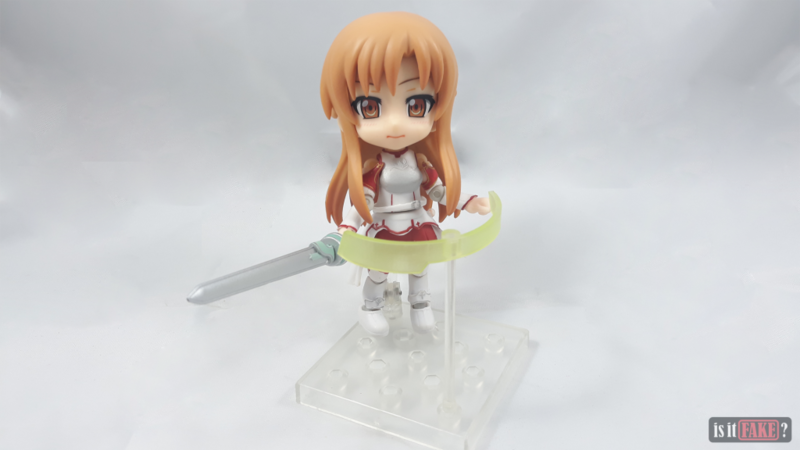 Through the adorable Cu-Poche figures, Asuna portrays that of her cute side. 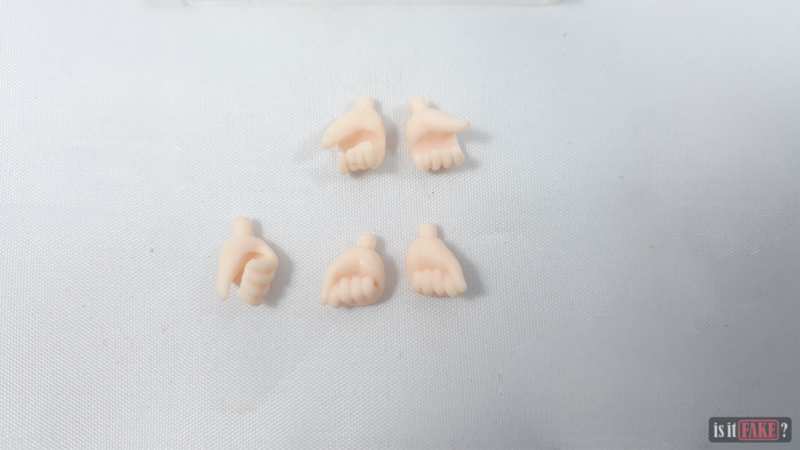 Not only that as Cu-Poche figures are highly customizable since they come with different facial expressions for the figure and other accessories depending on the character. Like Nendoroid figures, Cu-Poche figures from Kotobukiya is as popular and compete well within the Chibi figures niche. 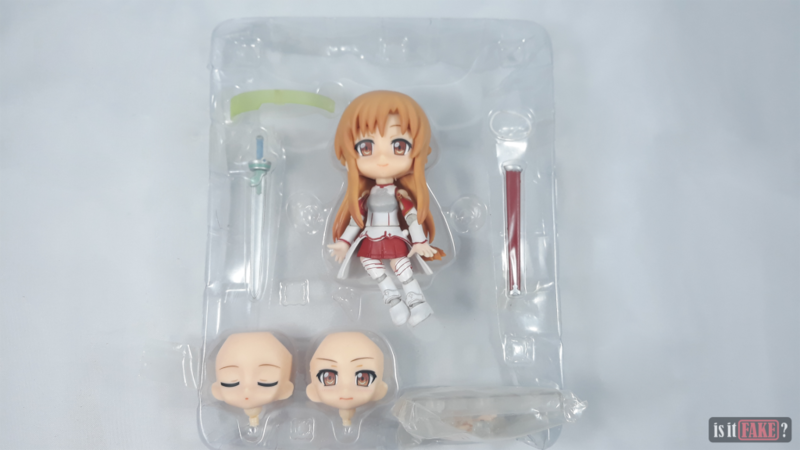 There’s no doubt that its popularity reached the notorious minds of bootleggers and if you’re not careful, you might end up getting tricked into buying a fake Cu-Poche figure – even worse, a fake Cu-Poche Asuna figure! 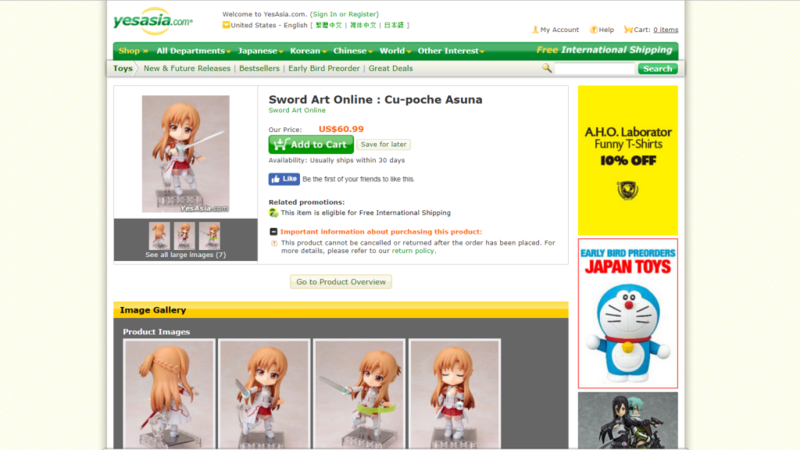 It’s a relief when searching for the Cu-Poche Asuna figure in google doesn’t give you top results from dubious websites like AliExpress. Instead, you’d get information on the figure followed by reputable shopping websites for anime figures. Though, one should always be cautious when buying figures online as it does require an ample research on a specific item as well as its source. 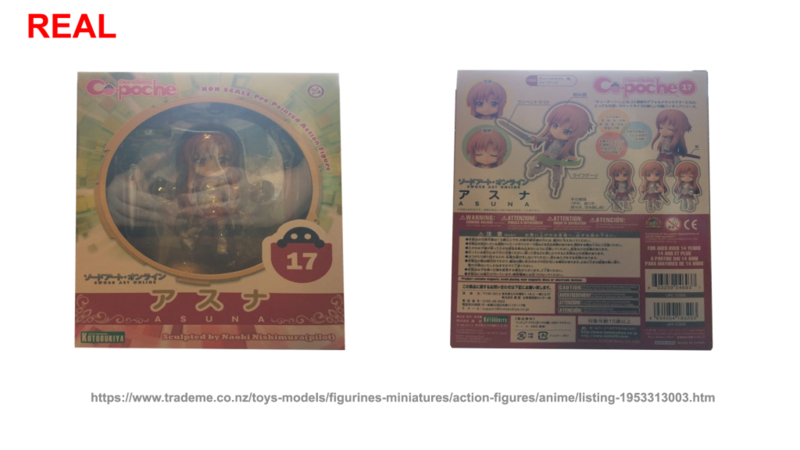 So, be worried enough if a suspicious seller similar to “Lucky bags home” decides to sell anime figures on AliExpress. 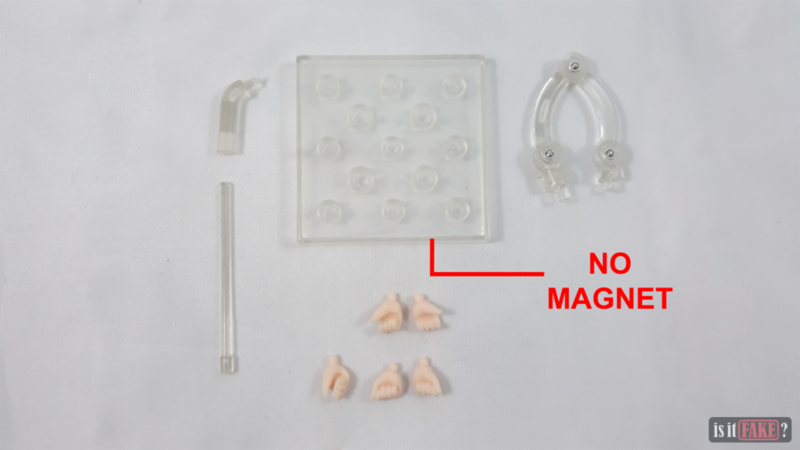 Many factories of figure manufacturers can be found in China because they see it as a practical location especially for mass production. 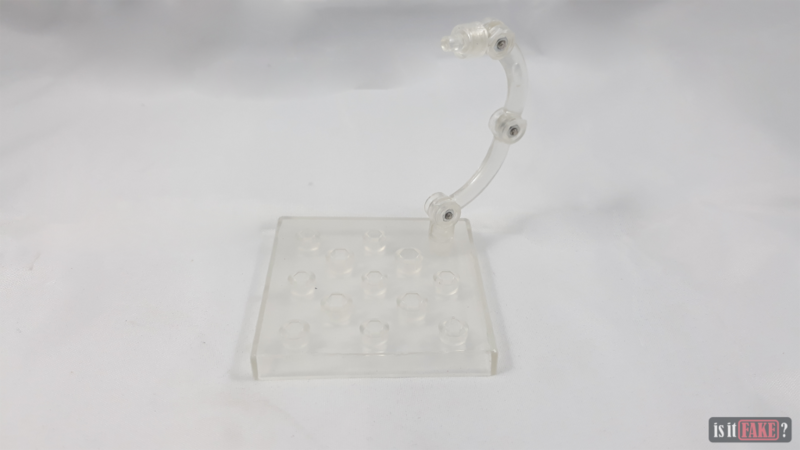 Though, there’s undoubtedly, numerous notorious bootleggers in the counter who try to steal manufacturers’ figure molds so that they could make a replica and sell it for a cheaper price. Unfortunately, they would never be able to pass the same quality hence, the faulty paint job and other countless flaws of fake figures. Regardless, figure piracy is still a redoubtable occurrence but it’s possible to mitigate it if every collector or fan will be aware about fake figures. 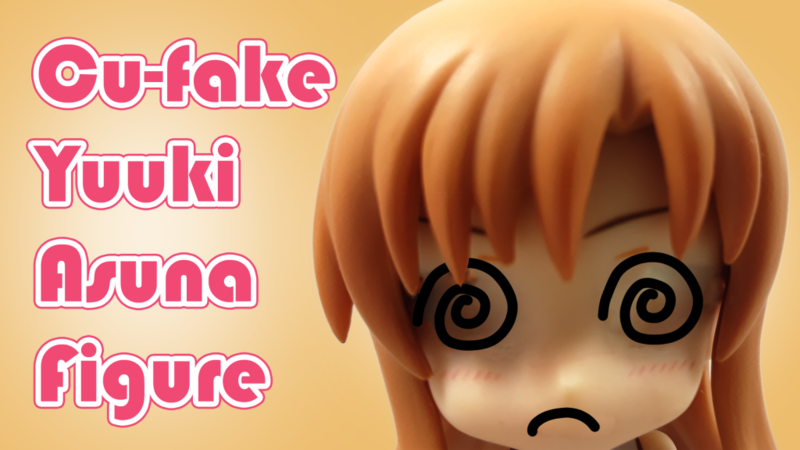 Thus, we’ll be putting the fake Cu-Poche Asuna figure to the test and see how much of a failure it is! 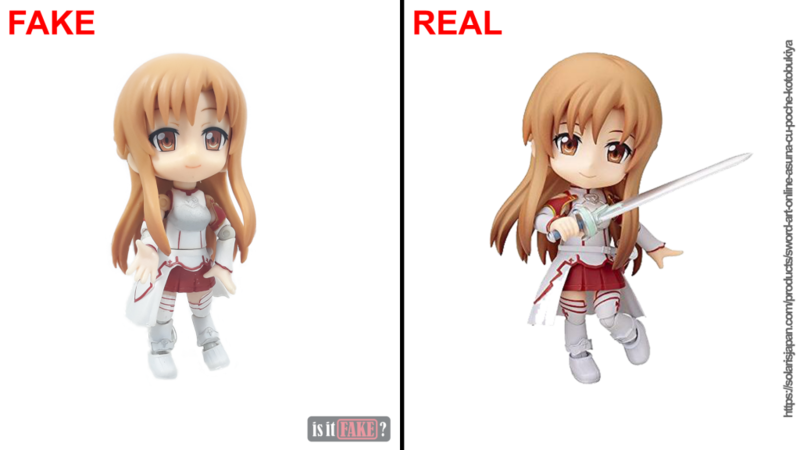 The fake Cu-Poche Asuna figure’s arrival was truly trivial. Not only did it come without a box but its plastic casing is almost good as crumpled as if it was forced to fit in the courier’s packaging. 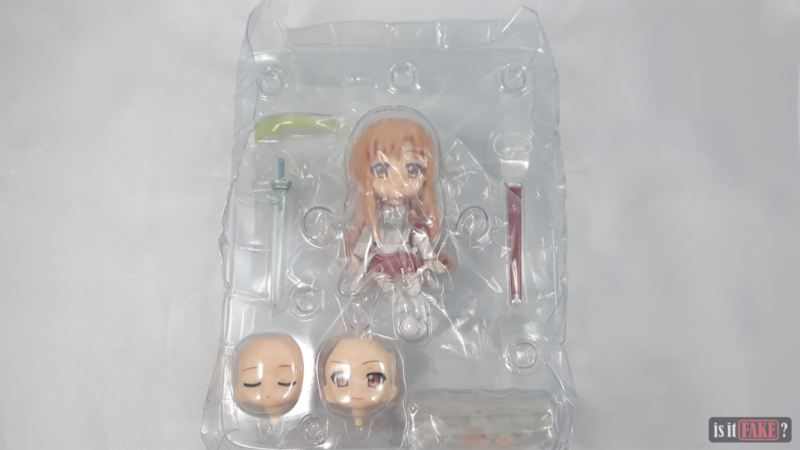 There was no way to tell about the fake figure’s box due to its absence but it gives us a hint that this seemingly Cu-Poche Asuna figure is up to no good. 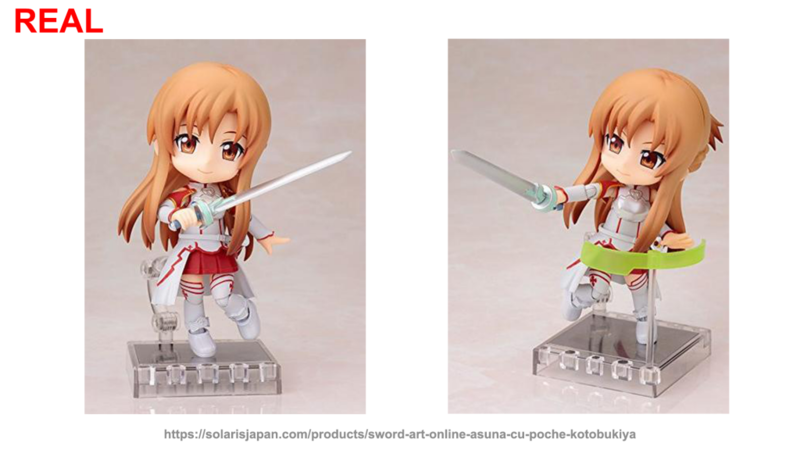 The real Cu-Poche Asuna figure’s box would look as the above images. 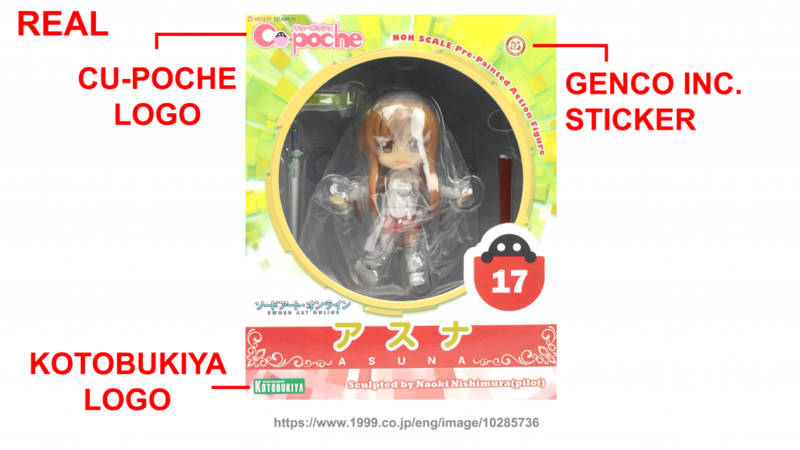 Undoubtedly, it would have the Cu-Poche and Kotobukiya logos in their respective places in the front of the box as well as Genco Inc.’s sticker of authentication like most legitimate Sword Art Online figures would have on their boxes. A Kotobukiya logo is also found at the back portion of the box, and links to official Kotobukiya websites are stated as well. Not to mention, the barcode is duly notable as it’s also an authenticating factor. 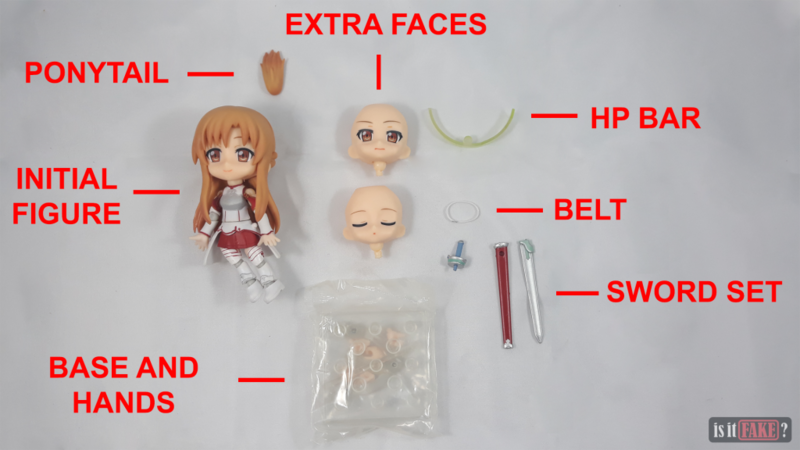 Going through the fake Cu-Poche Asuna figure’s components, we have a set of faces and hands for full customization, her sword and sheath, the base and attachable poles, and her detachable ponytail and belt. Indeed, it would seem like a legitimate figure at a far glance with the consideration of its complete components however the figure’s undefined smile says otherwise. 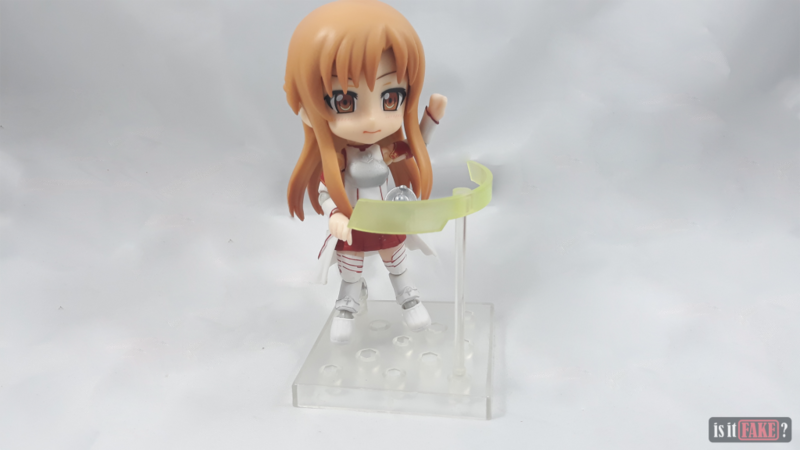 For a first, though, Cu-Poche figures are unique on its own as their bases have magnetic points to articulate their stability. 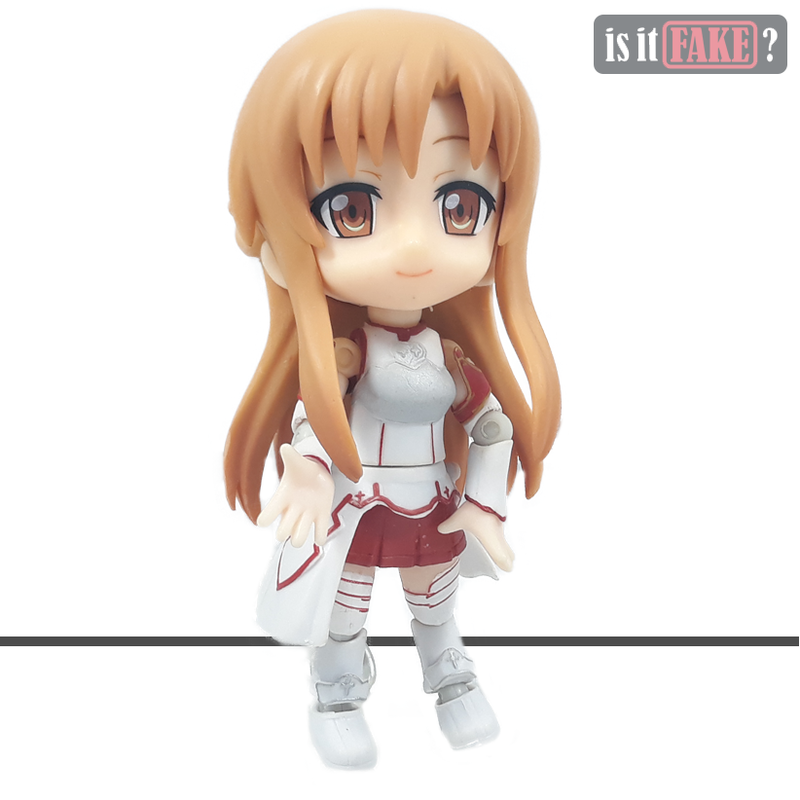 While real Cu-Poche figures are given a personal touch, this fake Cu-Poche Asuna figure’s base has already given us a hint of its forgery. Nonetheless, the fake figure itself is worthy of condemnation. 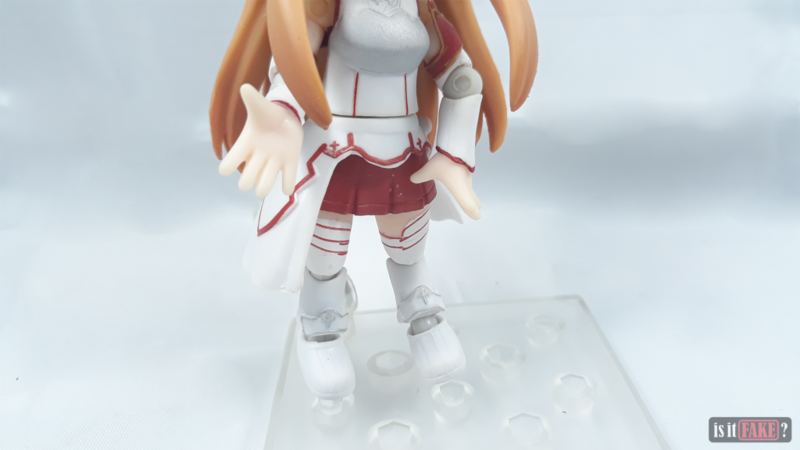 The fake Asuna figure feels like it’s made of toxic, cheap plastic as it gives this feeling that the plastic sheds dusty particles although it doesn’t give off a nasty smell like most fake figures. The paint job seems a bit off as there are noticeable scratches and misalignment in the details. The initial appearance of the fake figure already gives a bad impression. 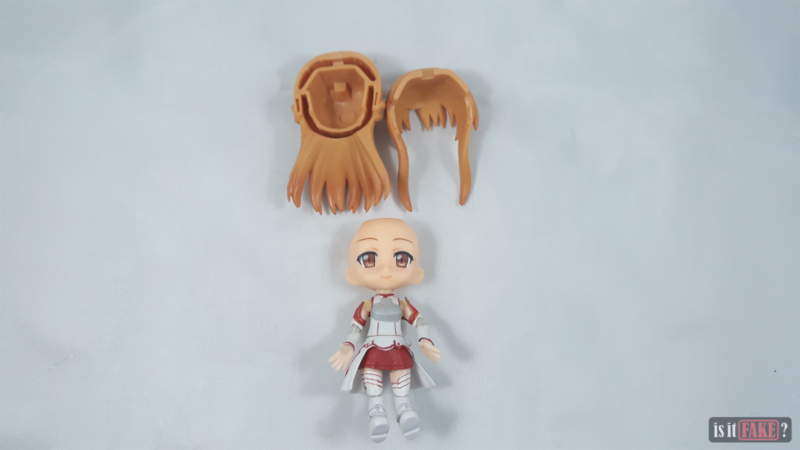 Moving forward, its hair, which is divided into two, is retractable for the face replacement although it feels loose and could easily detach when budged. 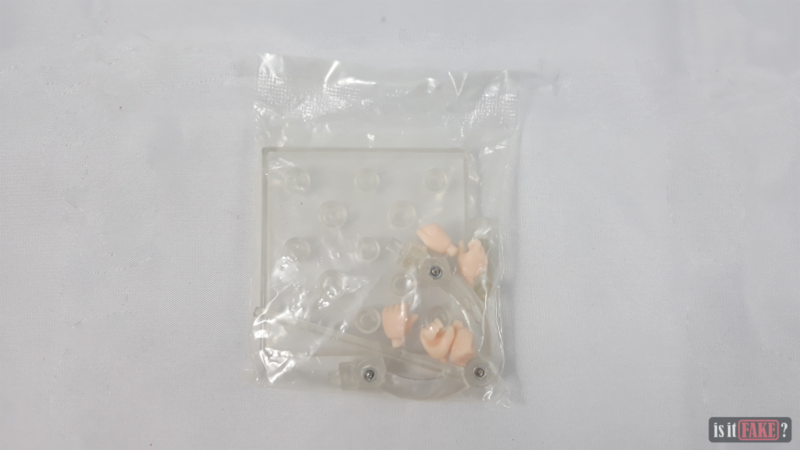 Its initial replaceable face is also questionable as its neck doesn’t come off from the body, assuming that it has to since the replacement faces come with each neck joints though the customization is still workable either way. 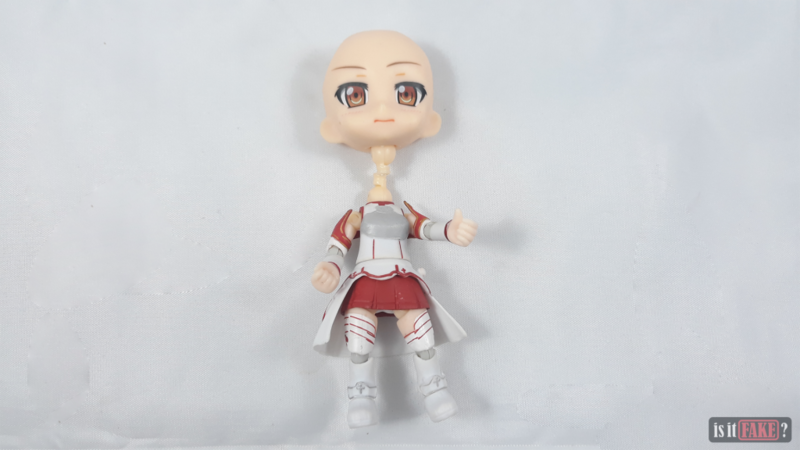 Surprisingly, most of its components are somehow compatible but with difficulty on attaching the sheath, its ponytail, and the figure itself to the base. 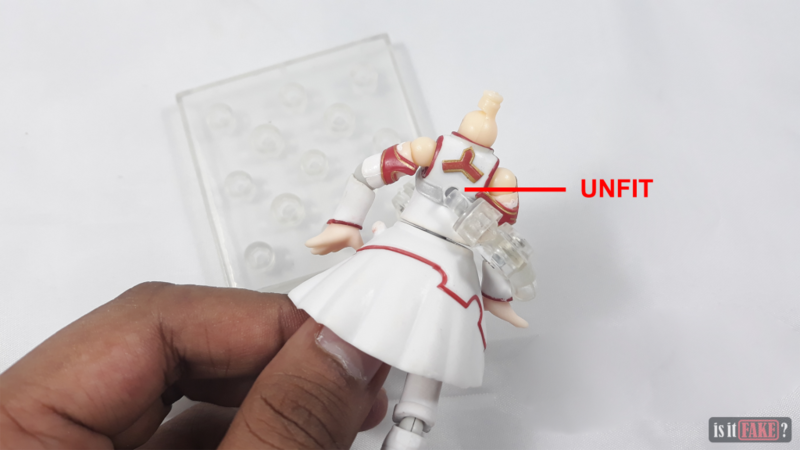 What’s most infuriating about the fake figure is that it could not stand properly because of a mishap on the spine. It would also absolutely fail as a Cu-Poche figure considering its lackluster features. With that being said, we go through several images of a well-defined, authentic Cu-Poche figure. 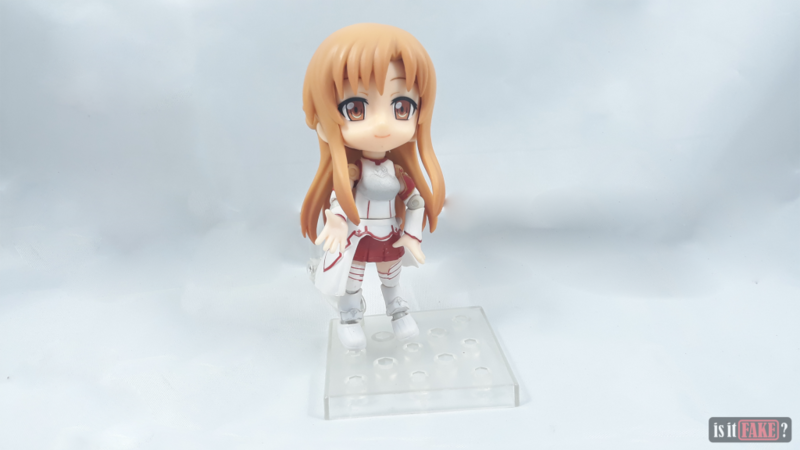 The remarkable customization of the Cu-Poche Asuna figure is what bootleggers were probably drawn to. You’ll be able to notice the on-point details on its clothing and especially, the lustrous breastplate that evenly shines. Its hair shade, clear eyes, and spot on paint job makes it superior to any fake figures. This authentic figure is truly a captivating masterpiece worthy of your pockets. Needless to say, you shouldn’t compromise your budget into buying a despicable bootleg. 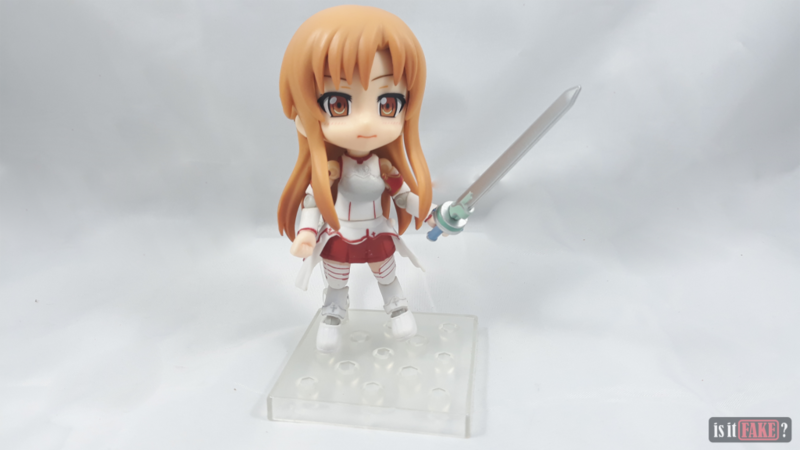 Sure, for a mere $14, you can already own a second rate Asuna figure which you wouldn’t even dare a Cu-Poche figure nor claim that it was made by Kotobukiya since it’s a fake figure. 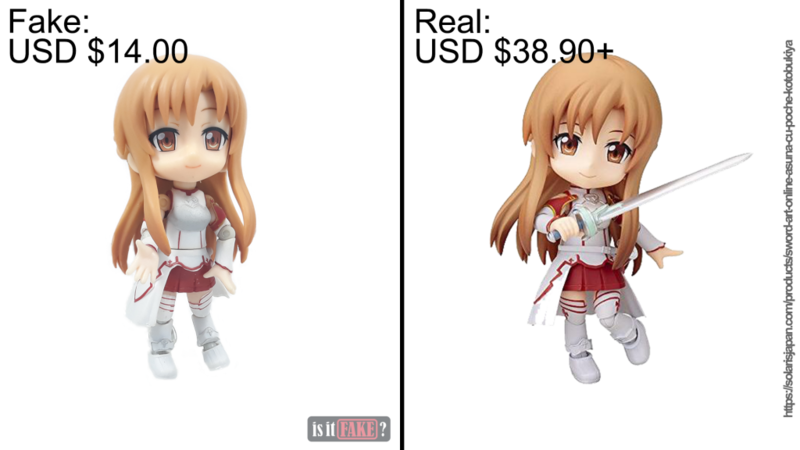 For a fake figure, your hard-earned money wouldn’t even be worth it and its value would just depreciate for the sham it is. 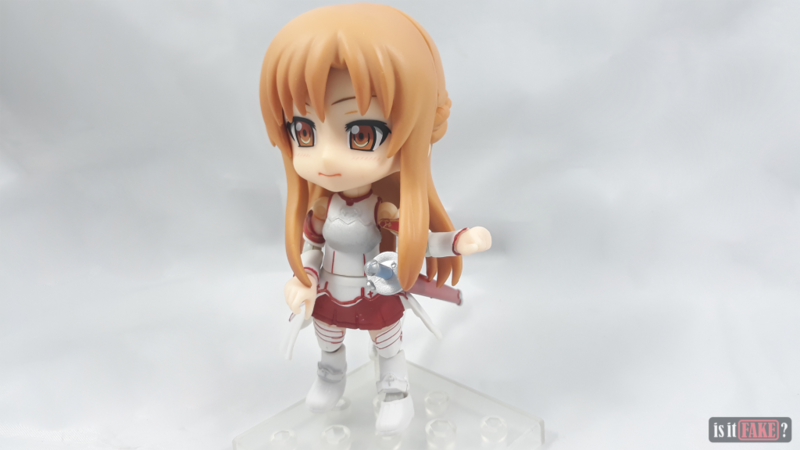 On the other hand, the real Cu-Poche Yuuki Asuna figure started at $38.90 back in 2014 on its recent release. Five years later, it’s almost as double because of its rarity. An in demand figure such as this truly speaks its value and only few online shops sell the real deal. 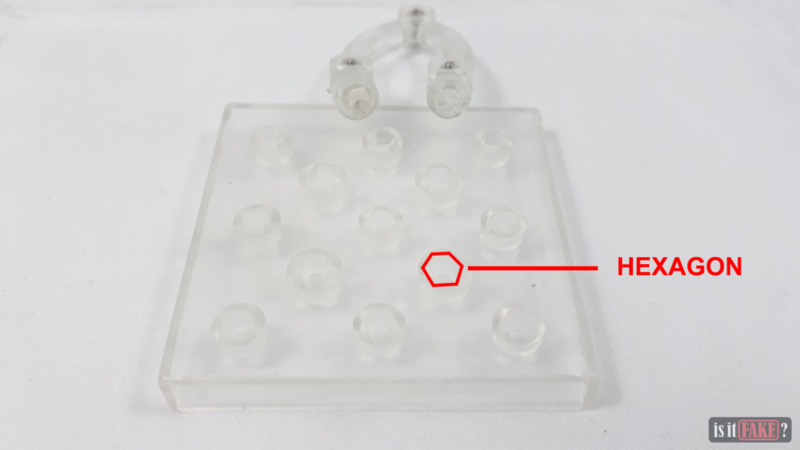 Whenever you’re looking for solid information on a certain figure, your first stop should be the manufacturer’s website. 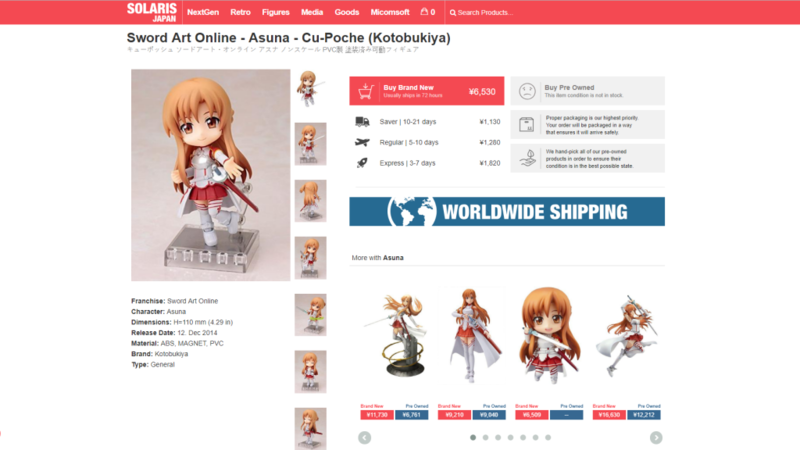 The Cu-Poche Yuuki Asuna figure by Kotobukiya can easily be found through a mere google search though together with the product information results are out of stock sources of the figure, unfortunately. The figure barely has any stocks from reputable websites like Amiami, and Otakumode, where they’re found for a cheaper price. 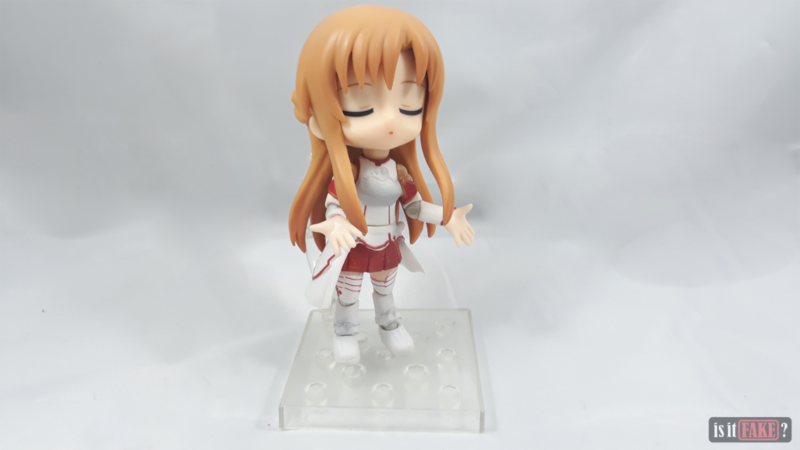 However, if you’re an avid collector of the Sword Art Online figures or let alone, Yuuki Asuna figures, then you won’t be bothered buying it for a slightly increased price. 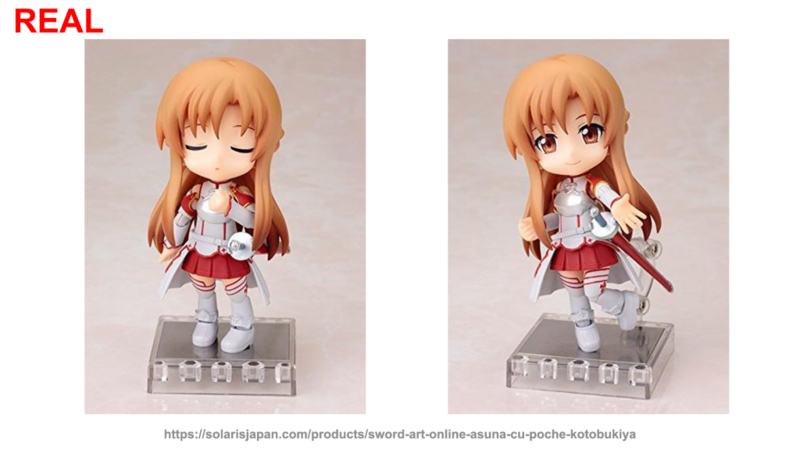 Solaris Japan still has Cu-Poche Yuuki Asuna figure stocks though for a price of roughly $59 which is definitely higher than the original price. Either way, it’s expected since it’s already been 5 years and Kotobukiya would have already stopped producing the figures and moved on to newer series of Cu-Poche. Surprisingly, YesAsia also has the exact figure for $60.99 and fortunately, the website offers free international shipping for orders $39 and above. It’s astounding to see such figure on stock in YesAsia as we usually use this reputable source for K-pop and K-drama stuff. Nevertheless, the figure is up for grabs and collectors will definitely be enticed! 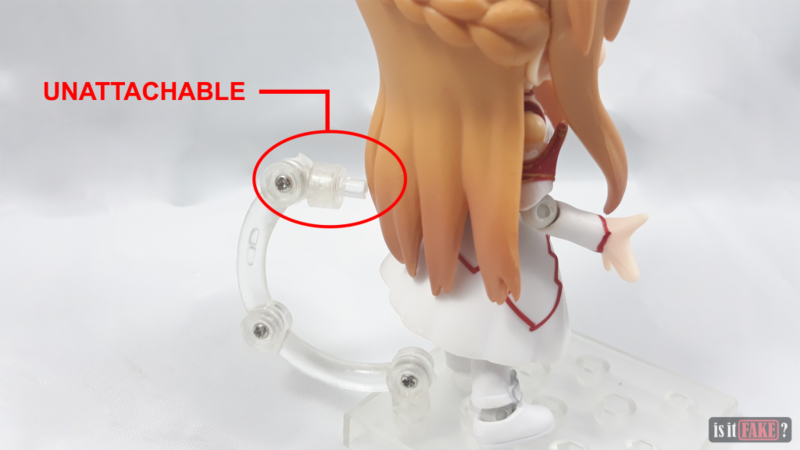 The fake Cu-Poche Asuna figure’s absence in presentation already raises the red flag that it’s to be avoided. Like most fake figures, its sloppy paint job is considerably the most infuriating to notice. It’s incredibly loose and wouldn’t stand erect on its base deeming it unworthy to be called a Cu-Poche figure. It’s an absolute rigged figure and we won’t hesitate to give it an 85% terrible rating.